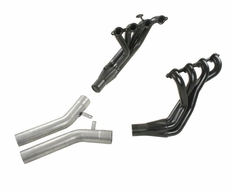 Pacesetter Performance Headers are the perfect solution for your vehicle. Whether you simply need to replace a cracked/rusted exhaust manifold, getting your truck race ready, or you�re just looking for some extra horsepower and torque, Pacesetter Long Tube Headers will get your vehicle breathing better thanks to their large 1 7/8" primaries! The part number for this item is: 70-2370 and it fits 1997-2004 Chevy Corvette C5.